HoneyWorks™ is a safe, drug-free honey-based sore throat and cough remedy product line made with 100% US sourced certified organic dark honey. How is HoneyWorks™ different from other cough remedies? HoneyWorks™ is the only honey-based product line sold at major drug and mass market retailers to be made with 100% U.S. sourced certified organic dark honey. HoneyWorks™ has no artificial additives, such as dyes, preservatives, artificial flavoring and artificial coloring, is GMO free, gluten- and dairy free, tree nut and peanut free and has zero trans-fat. HoneyWorks™ is made with 100% U.S. sourced certified organic dark honey. While darker honey is more flavorful and intense than light, it also contains more nutrients, including vitamins, minerals, and antioxidants. To be certified organic, the honey must contain ingredients with 95% or more certified organic, meaning free of synthetic additives like pesticides, chemical fertilizers, and dyes, and must not be processed using industrial solvents..
What are the key benefits of dark honey? The color of honey varies according to their botanical origin and the weather of the place where the plants grow. In general, dark honey has higher mineral content (e.g. potassium, manganese, iron, sodium, etc.) than lighter ones. Also, the darker the honey color, the higher the phenolic and flavonoid contents and the antioxidant levels, which are critical in counteracting free radicals responsible for triggering the aging process and diseases, such as cancer, hypertension and high blood cholesterol and diabetes (General Medicine, 2014; Food Chem. 2007). Full-bodied honeys, such as Blackbutt, Jarrah, Manuka, Thyme, Dandelion, Leatherwood, Meadow, Heather, Chestnut, Honeydew, and Buckwheat happen to have darker color. The 100% U.S. sourced certified dark honey can effectively calm coughs associated with hoarseness, dry throat, and irritants. * Honey has long been used as a sore-throat remedy. It has antibacterial properties and also acts as a hypertonic osmotic, which means that it draws water out of inflamed tissue. This reduces swelling and discomfort. What type of products does HoneyWorks™ have? Please visit our products page for more information on all our products. Why is HoneyWorks™ good for children? 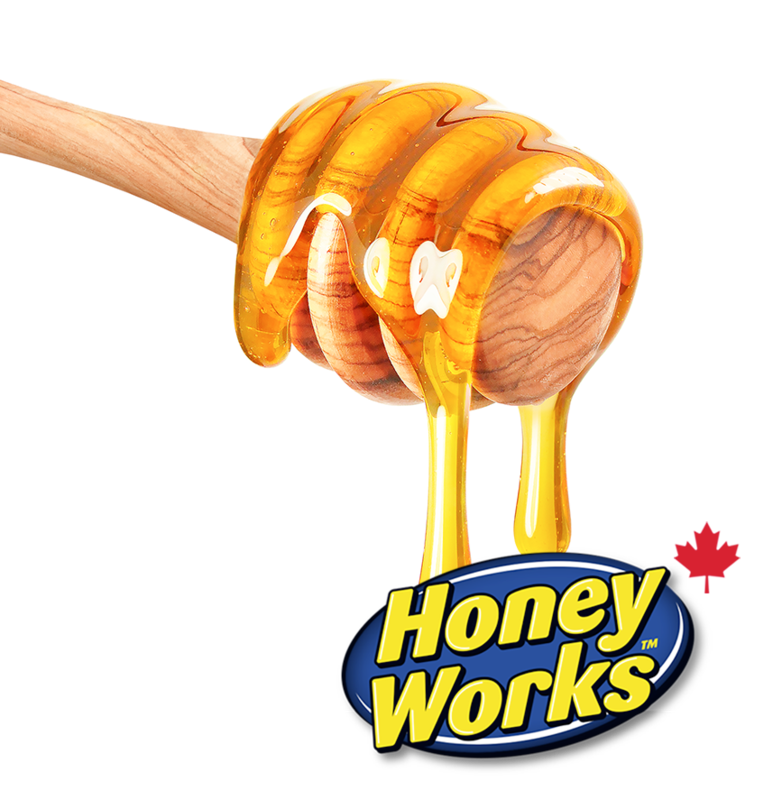 HoneyWorks™ Kids products provide a safe, drug free honey cough remedy made with 100% certified organic dark honey. The main ingredient of honey acts as a soothing agent on inflamed mucus membranes and irritation, which in turn may cause coughing. Apart from coughing and irritation, honey is also useful in reducing difficulties associated with swallowing. Additionally, HoneyWorks™ has no artificial additives, such as dyes, preservatives, artificial flavoring and artificial coloring, is GMO free, gluten- and dairy free, tree nut and peanut free and has zero trans-fat. HoneyWorks should not be given to children under 12 months of age. No, HoneyWorks products do not contain caffeine. Yes. HoneyWorks™ contains no gluten, artificial colors or flavors and is GMO-free soy-free, dairy-free, and peanut and tree nut-free. HoneyWorks also has zero trans-fat. Can HoneyWorks™ products be taken during pregnancy or while nursing a baby? As with any medicine, if you are pregnant or nursing a baby, seek the advice of a health professional before using HoneyWorks™ products. HoneyWorks should not be given to children under 12 months of age. HoneyWorks™ is safe and effective when used as directed. Do not exceed the recommended dosage. Do not give to children under 12 months of age. Can I take HoneyWorks™ with my existing medical condition? What age is HoneyWorks™ intended for? Do not give HoneyWorks to children under 12 months of age. Please visit our product page for intended use and age restrictions on each product (as they may vary). Are any HoneyWorks™ formulas for diabetics? Please speak with your healthcare provider for their recommendation in the context of your overall health history. How do I take HoneyWorks™? HoneyWorks is available in two forms depending on the product purchased—spray and syrup. Please visit our product page for more information. Will HoneyWorks™ leave me feeling drowsy? HoneyWorks should not cause drowsiness unless you’re using our Night Time syrup. How often can I take HoneyWorks™? Most of our products should be taken every 4 hours or as needed. Please visit our product page for more information. Can I take HoneyWorks™ with other medications? Please speak with your healthcare provider for specific instruction depending on your medication and health history or call us at 1-866-467-2748.